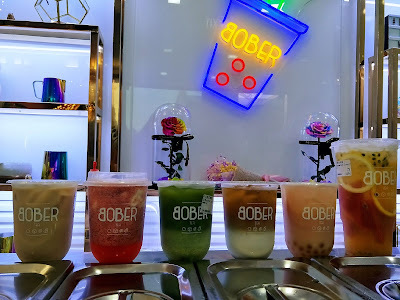 Being a far-eastie with ALL sorts of bubble tea shops tucked away at different corners of our malls, when I tell you that Singaporeans love their bubble teas, believe me, they really do. Be it Gong Cha, Koi, Liho, or Playmade, those lines of thirsty patrons waiting for their drinks never cease right up to their closing time. And so, here's a fantastic piece of news for all you bubble tea fanatics out there. Your bubble tea has just gone artisanal. 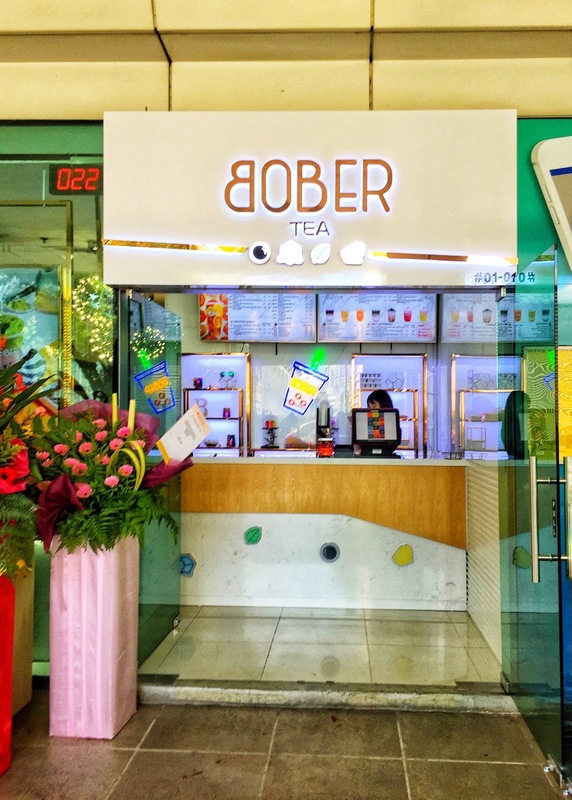 Conveniently located at Bishan MRT station (near the bus stop), Bober Tea is an artisan tea, focusing on providing patrons with an affordable and yet high-quality and tasty blends of tea with a touch of local flavours. The founder, through his travels abroad to countries like Taiwan, Japan and China, realised that their bubble teas are vastly superior to what we currently have in the local market and thus, was inspired to bring together the quality of those teas with high grade, homemade bobas and henceforth, creating Bober Tea! 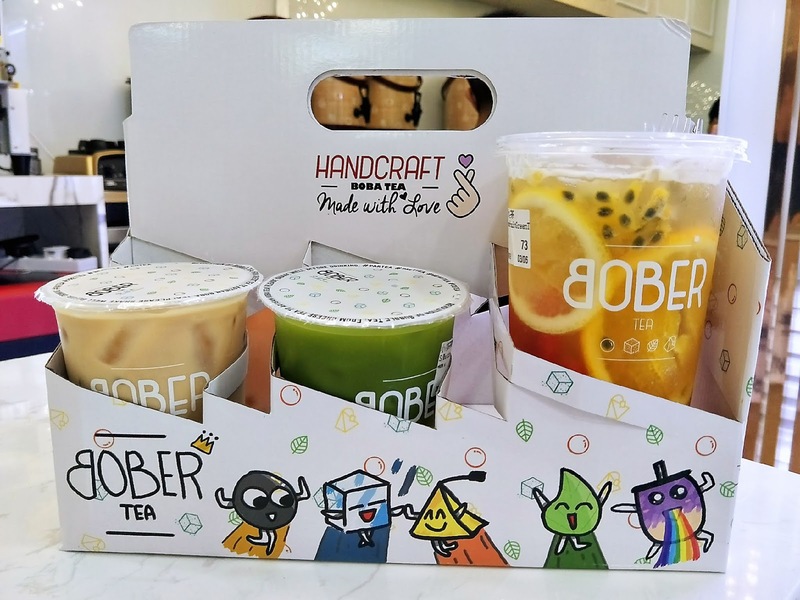 Bober Tea uses only premium ingredients, such as Okinawa black sugar, Hokkaido milk, pure matcha powder, grade A fresh fruits and etc. And as already mentioned above, their bobas are homemade and hence, healthier compare to those highly processed, artificial types that mass produced in factories. 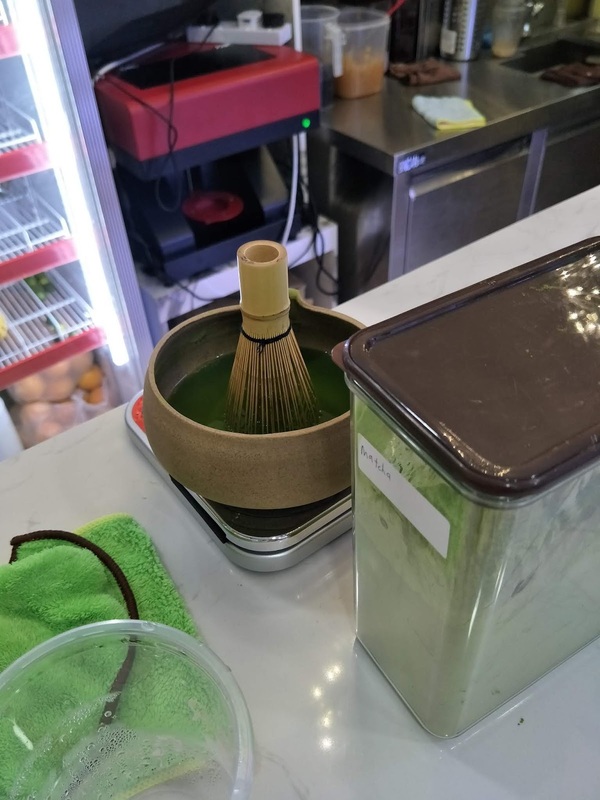 And this is how they prepare their matcha flavoured drinks, with pure matcha powder, proper tea bowl and a cute bamboo whisk! And somehow I felt kind of zen as I watch the staff whisk up the concoction over the counter. And as Bober tea love aesthetically beautiful things, they've not only given their cups a cute, unique rounded design, but also has a super adorable cartoon take-away box for purchases of 6 drinks and above. My friends (you didn't expect me to finish up all 6 drinks by myself, did you?) and I love Mr. rainbow-puking purple drink. This cartoon box is so cute, random commuters just kept eyeing it while I traveled back to the east on the train. Or perhaps they were thinking, "Wah, this lady so greedy. Bought 6 cups of bubble teas for herself?!" 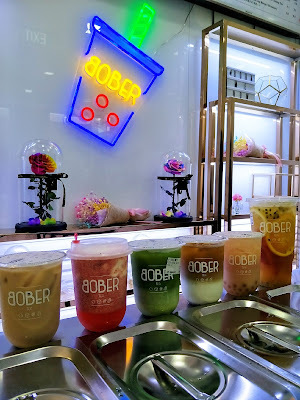 Anyway, Bober Tea boasts of many different creative milk tea flavours, such as Black Sugar Konjac Jelly Milk Tea, Black Glutinous Rice Milk tea, Collagen Jelly Milk Tea, Roasted Walnut Oolong Milk Tea, Brown Sugar Pearl Milk Tea and etc. Something that caught my eye (but I didn't try it though) was the Brown Sugar Fresh Milk with 65 degree Celsius Boba. 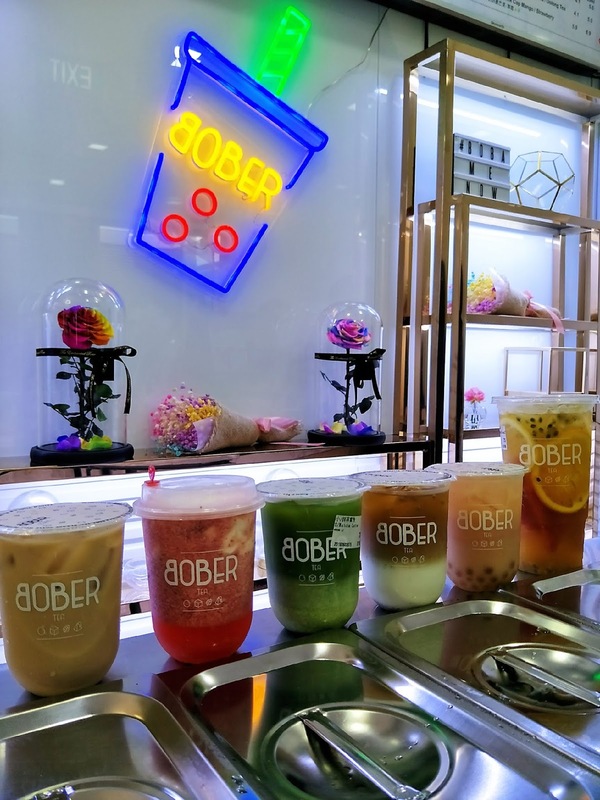 Cold milk with hot boba, sounds really interesting, yes? It's good to know that their prices are also pretty reasonable, going at as low as just $2.20 for a 500ml cup of their basic teas and up to $7.20 for 1000ml cup of a more special concoction. And now, here's the 6 flavours I've chosen for a taste test! Most of my choices comes with fixed sugar levels except for the Hazelnut Milk Tea, which I've chosen a 25% level. 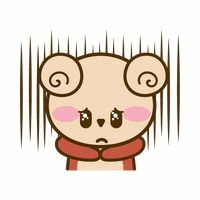 But having cut out added sugars from my diet for more than a year, I found that it could have been less sweet, although still not overbearingly sweet (but I'm sure that's just me) so perhaps a zero sugar level would have been perfect for me. The Hokkaido Milk Cap Strawberry was my absolute favourite among the lot! Well, they've successfully married two of my favourite food (strawberry and milk, how can you go wrong with that?) together into one adorable cup. How can I not love it? My initial few sips were mainly just the strawberry portion of the drink and much less of the milk, which was light, tangy and refreshing. After stirring in the milk cap thoroughly, I got myself a brand new drink, a ridiculously rich and creamy strawberry milkshake. So I guess you can also call this a buy-one-get-two kind of drink? Next up, the Roasted Oolong Latte with Walnut was pretty good, but having the walnut bits soaking in the drink for too long turns them into... brown rice bits? Or I should say, taste more like brown rice bits. Haha, I know this sounds really weird, I don't understand how it got there either. The main attraction point of the Ruby Grapefruit Yakult with Boba Pop definitely has got to be the popping boba! Texture wise, they kind of resembles a giant ikura (salmon roe). 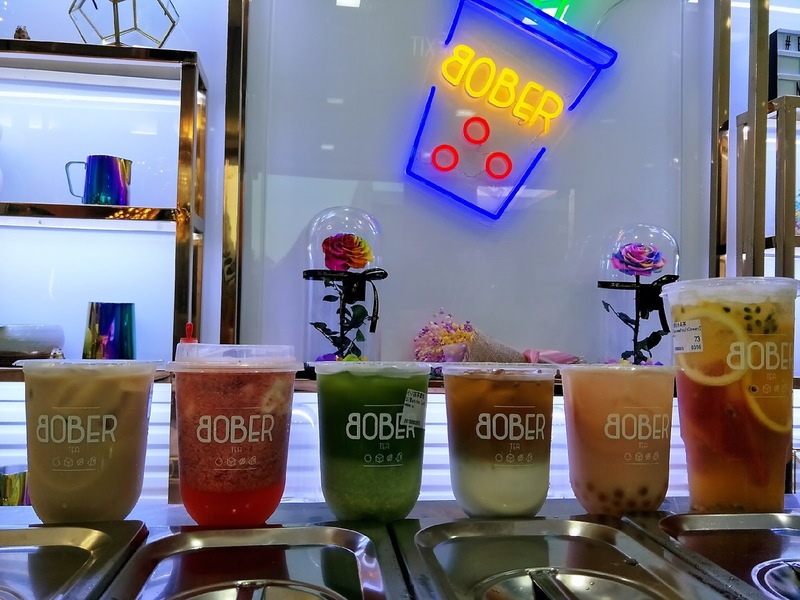 Popping the boba immediately releases a sweet and tangy flavour of passionfruit into your mouth, adding a lot more oomph to the drink. 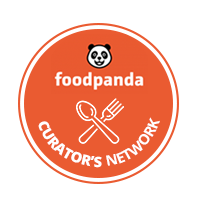 However, as you can probably understand from the name itself, if you're not a fan of sourish food, do give this a miss. Grapefruit paired with passionfruit will not be your best friend if you do not enjoy a good punch of tangy flavour. Last but not least, only available in 1000ml serving, the Supreme Fruit Burst Green Tea seems rather intimidating initially, but it was really refreshing and also judging that most of the volume probably came from the tons of fresh fruit they packed into the cup, this would be your best choice of a healthier, everyday drink to combat the scorching hot weather these days.